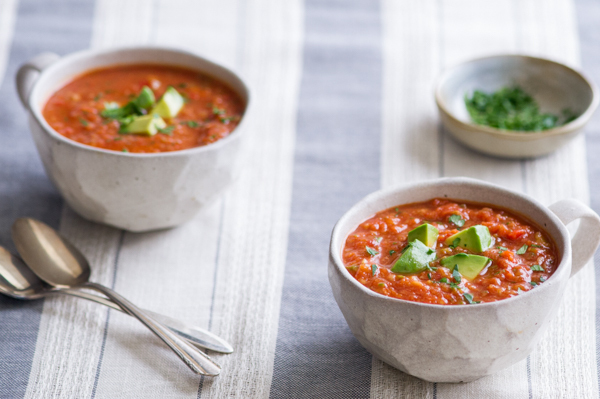 Today, we’re showing you how to get macho with gazpacho, a chilled tomato soup that’s Spanish by birth but can easily be made into your own signature dish with a few tweaks. This is a refreshing summer appetizer that’s perfect for parties and using a KitchenAid® Hand Blender makes it a snap to whip up. First, go ahead and get all of your ingredients together and make sure they’re measured, peeled (if applicable) and cut into chunks. You don’t have to chop anything finely or even make them uniform, as the hand blender will handle that. 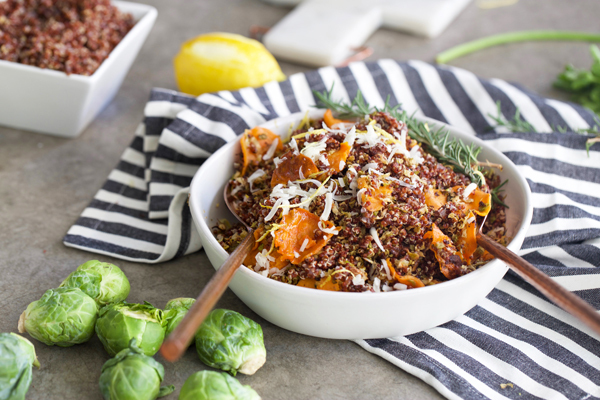 We’re making this recipe in two batches, so put half of all of your ingredients into the blender bowl attachment that comes with the Hand Blender – make sure the blade is inside before adding your ingredients. I recommend adding the wettest ingredients first and finish with the spices. Twist on the bowl’s top and attach the Hand Blender handle. 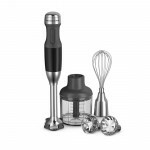 Set the blade speed to “3,” the highest speed by turning the dial on the blender handle. Blend the ingredients by pressing down the button on the handle. Blend for 30 seconds if you prefer a chunkier gazpacho, and up to a minute or more if you want your gazpacho smooth. Check out the consistency of your gazpacho and taste a spoonful to see if you’d like to add more salt, vinegar or heat. This is where you can get even more macho! If you didn’t already, toss in a fresh jalapeno that’s been seeded and quartered or take it in a different direction with some dried cumin or fresh cilantro. Repeat steps 1-3 to make the rest of the gazpacho. Chill for at least two hours or overnight. 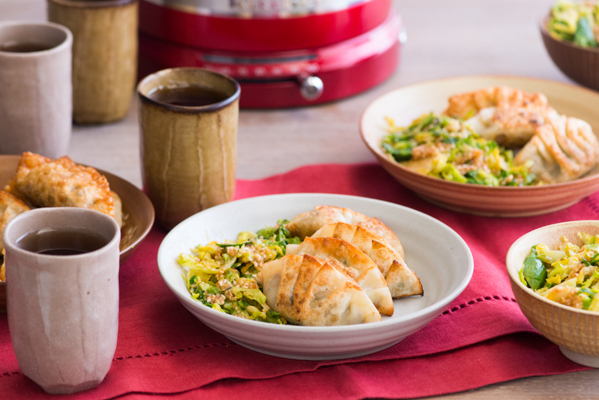 Serve topped with chunks of avocado, hot sauce and whatever additional crunchy toppings you desire! You can see just how easy it is to whip up a refreshing summer appetizer in just a few steps using the KitchenAid® Hand Blender with the bowl attachment. It’s more difficult to make a great gazpacho in a blender, because you’ll wind up with a purée with no texture. Unless you’re in the mood for a spicy tomato smoothie, I’d suggest sticking with the hand blender! 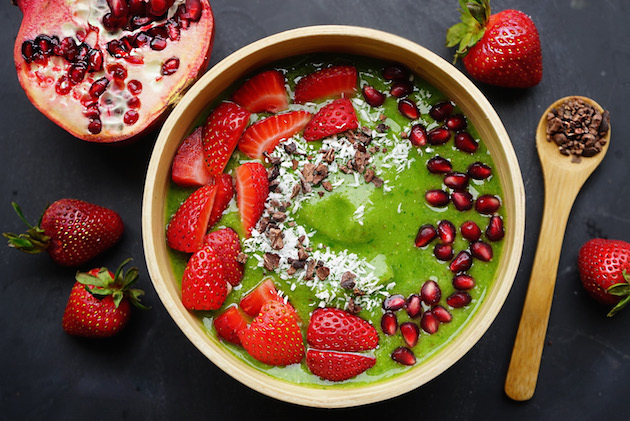 The nice thing is that if you want to make this for a larger group, you can certainly use the blade attachment and a large bowl or pot instead of the blender bowl. Just make sure you use a glass or non-reactive metal bowl or your tomatoes will taste of metal. So, what are you waiting for? As long as tomatoes are in season and barbecue and picnic weather is here, try your hand at this easy recipe and get macho with gazpacho by making it yours! Add everything in the main ingredients and optional modifications list to a big bowl and blend half of it, leaving half chunky. If using fresh tomatoes and you feel gazpacho is too thick, add water 2 tablespoons at a time until achieving desired consistency. Top with optional toppings and eat! I made this delicious cold soup, pretty much followed the recipe, for a 30 people get-together last Sunday. Used Chipotle Pepper for heat and a little smoky touch. 2 quarts, everything from the local Farmers Market. With garlicky French Bread. NO leftovers! @disqus_KDaBp8Zdiy:disqus That’s awesome! SO glad you made and enjoyed this with friends – that’s the way to do it. So perfect for tomato season, too. Thanks for sharing your story!